Have you heard of "What I Wore Wednesday"? You probably have. 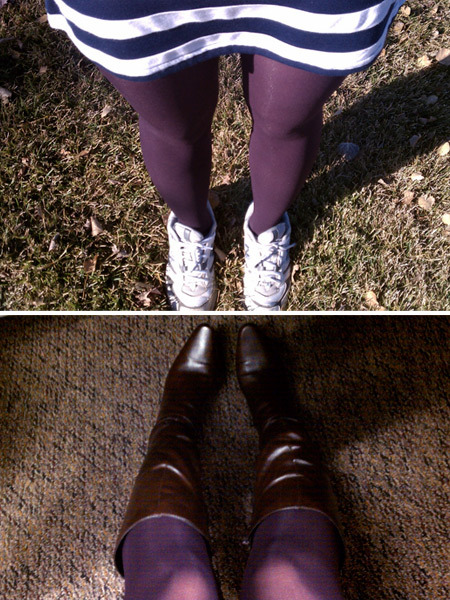 Every Wednesday, the hashtags are buzzing on Twitter, #wiww and #wihww [what I honestly wore Wednesday] abound. My curiosity gets the best of me and I click - what's this? Another cute outfit? And that one! Ooh - I like that headband! how do i wear this? am i drowning in it? There are fashion rules, right? But then trendsetters break them and establish new rules, contrary to the ones we had before, and suddenly those are the rules. It's all so confusing. At least that's my excuse. So maybe sometimes I get really rebellious, break the rules, and wear leggings as pants...but just once. 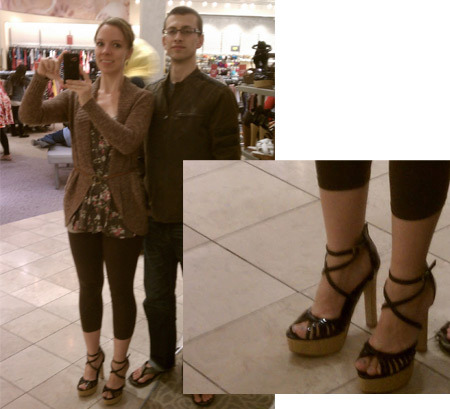 And if I could have actually walked in these $7 shoes, they'd be mine. It's a little embarrassing sharing my fashion faux pas with the world, but hey, I'm living on the edge. :-) Does this happen to anyone else? I love your leggings as pants look! I don't think its a fashion faux-pas at all, since the shirt is longer. In fact, its so cute that I just may have to copy that outfit... =) Thanks for the headband love. So glad you liked it! 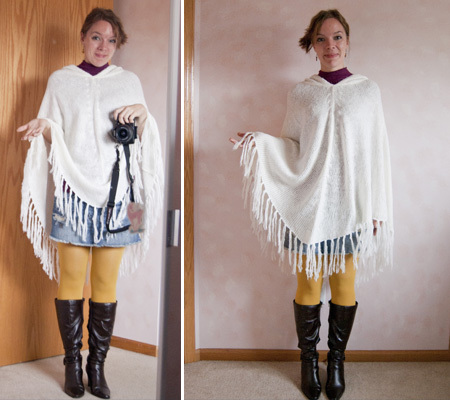 I think we talked about the woes of styling mustard-colored tights, they are SO hard to pull off! But yours look adorable with the boots and the poncho. Love it! Aw, thanks! We did discuss those mustard tights and I am determined to rock them out as often as is reasonable. :-) Side note - can you tell we haven't painted any rooms in our house yet? I think the fashion rule about leggings is that if you wear them as pants you also wear a tunic-length (read cover-your-booty) top. You look fantastic!